free colleen :: previous links to "great stuff"
“What did it cost to be Eugene O’Neill?” Lloyd Richards asks. A great documentary on the great man. There are a couple of clips of Al Pacino “acting,” but the rest of it is terrific enough to offset this. Wendell Berry is a farmer, a writer and a Christian — and better at each of those callings than I am. Shakespeare spoke nothing like his modern interpreters. Here's a sampling of what the Bard meant his plays to sound like. A clean cut Frank Zappa chats up Steve Allen and plays the bicycle. Just watch. Let me draw you a picture. Some people still have a hard time wrapping their minds around climate change and global poverty. Here’s a handy interactive graphic that just might make it clear. Woody Allen interviews Billy Graham. Woody: You know, when I look in the mirror in the morning, it’s hard to believe that. What’s the reward for a lifetime of creating theater and movie magic? Don’t ask. On a damp grey afternoon, I clicked on the Schumann. Suddenly it was a beautiful day. 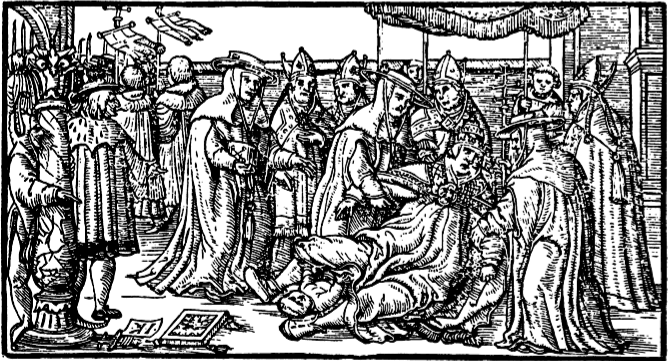 Woodcut of Pope Joan giving birth during a street procession. A few words from E.B. White, who could do more with a few words than anyone. Shall I Not Compare Thee? Billy Collins reads “Litany,” a good poem that makes fun of bad ones. No one is ever the blind woman’s teacup. Sculptor John T. Young converts the diving fins of nuclear subs into works of art. Well, the hurricane blew down the autumn leaves before they could put on their fancy dress ball. As a consolation prize, here’s Yves Montand introducing “Autumn Leaves,” originally “Les Feuilles Mortes,” in his wonderfully depressing Gallic way. Two of my favorite Williams create possibly the greatest moment in cinematic history. 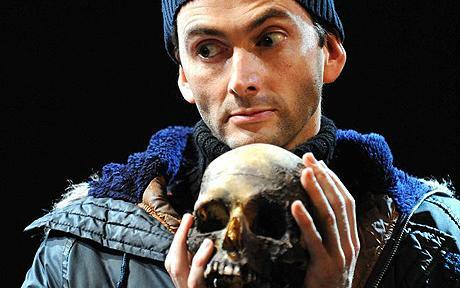 David Tennant is my favorite Hamlet and favorite Doctor. There’s not even a word for that level of achievement. Here he combines the classic and the intergalactic. Brilliant and funny video by Steven Appleby about thinking. Would that we were all as good at it as he is. That’s from one of Peter Maurin’s Easy Essays. Maurin (1877–1949) co-founded the Catholic Worker Movement, people who tried — and are trying still — to be authentic Christians by choosing lives of poverty and peace. Maurin was a mystic, farmer, social agitator and about 12 other worthwhile things. You can read more of his still relevant Easy Essays here. Written contents copyright © Colleen Shaddox. All rights reserved.